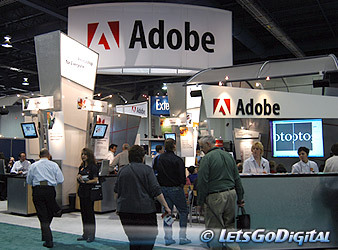 Adobe Systems announced during the PMA show in Las Vegas a new Camera Raw plug-in for Photoshop CS, extending raw file support to 14 additional digital camera models. Available as a free download from Adobe's Web site, the plug-in builds on the raw file functionality integrated in Photoshop CS, adding new support for digital cameras from leading manufacturers such as, Fujifilm, Kodak, Leaf, Leica, Nikon, Olympus, Panasonic, Pentax and Sony. The Photoshop Camera Raw plug-in allows photographers to directly manipulate the original data captured by a digital camera sensor, producing images with superior tonal range and the maximum amount of detail. Accessing the raw image before conversion into formats like JPEG and TIFF allows users to adjust the white balance, saturation and sharpness instead of leaving these decisions to the camera's automatic settings. With the addition of the plug-in, Camera Raw functionality in Photoshop CS software now supports formats from more than 40 different camera models and allows professional photographers to easily manipulate their "digital negatives" without sacrificing any image quality. Now, professional photographers can more quickly and easily import and manipulate raw data, saving time while increasing artistic control. Adding raw file conversion to a professional photographer's workflow is now easier than ever with Photoshop CS. The redesigned File Browser allows users to view thumbnails and large previews of raw captures for easy sorting and batch adjustments. Support for 16-bit images provides photographers with the opportunity for optimal image quality by keeping the layers intact when saving files. A new Camera Raw interface in Photoshop CS now includes advanced calibration controls and the ability to create and save customized color profiles for individual cameras. Pricing and Availability: Available immediately on the Adobe Web site, the additional cameras supported by Photoshop CS, include: Fujifilm FinePix F700, FinePix S5000 Z and FinePix S7000 Z; Kodak DCS 720x, DCS760 and DCS14n; Leaf Valeo 22; Leica Digilux 2, Nikon D2H, the Olympus C-5060 Zoom and E-1; Panasonic DMC-LC1; the Pentax *ist D; and Sony DSC-F828. The plug-in supports Photoshop CS customers running Mac OS X 10.2.4 and higher, Microsoft Windows 2000 with Service Pack 3, and Windows XP. The updated Camera Raw plug-in can be downloaded for free by going to the Adobe Web site.